Last Sunday we hosted our first Spring Bridal Event at the Crocker House in New London. While I've done weddings at the location, and have always loved it, it felt like the right place to host a bridal event. 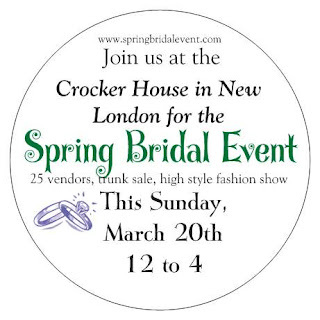 First day of Spring seemed perfect and it did to about 4 other bridal show companies too. :) While the crowds weren't crazy even though we had a nice amount register, the couples were great! They took their time engaging all the vendors. I saw many walk around over and over again. The best part of the day, was during set up. Watching other vendors assist each other was heart warming. We had linens from Arrow Paper Party Rental and we ended up needing more. It was refreshing seeing vendors share and make it work. Thank you to Sara Faella for creating an art filled fashion show. Her Beauty squad made the already amazing models look shine and a special thank you to Samantha Sojka, Miss Connecticut Teen for joining us as a model. It was great to see how the looks worked with the gowns. There were so many wonderful vendors and I thank them all for the great time, effort and work. Thank you. Visit there links on the website. 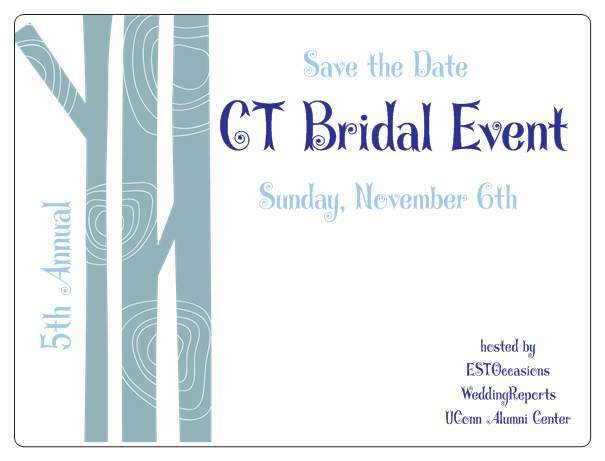 Our fall CT Bridal Event will take place at the UConn Alumni Center, which has been its home for the past 4 years. The event takes place Sunday, November 6 from 11 to 3. What we are doing differently this year is that on Friday, the 4th, we let vendors come and start to set up. Then they can stay and join us for a WedWork networking event. Free to all wedding professionals, speak with a trade show master and network. We figured this was a great way to get some of that morning set up rush out of the way and get in some networking too. I've said it before and I'm sure I will say it again but there tons of benefits to using a planner. Planners offer you savings in many differently be it saving you money, time, mistakes, and more. I reached out to a few fellow Connecticut Planners to ask to name a few of their favorite SAVES. I asked Carisa from CR Socials what was one of her favorite saves. She had been able to negotiate a brides photography package from $4200 down to $2100, by making sure the package only included things that the bride needed. She also has shown couples how a wedding date can change the price. As a planner, she can guide you to venues and packages that will work best for your wallet. Michelle Neff from Dreaming Tree Events finds her biggest savings come in the venue selection and flowers. While most planners aren't florist, we have great understanding of expensive flowers, local flowers and what small changes can do to your floral budget. When it comes to centerpieces the cost depends mostly on the type of flowers. Michelle likes to remind her clients to be open to different suggestions in the flowers and helps in alternative options. When it comes to venues she says "I tend to think a lot of brides get nervous about non-ball room sort of locations because they are worried about what guests might think of it being different so they just go with what is familiar and fall into the "package deal." Connecticut if filled with a selection of places to rent for very little and Michelle likes to find the right place for each couple. I love when I can save here and then there and little bit more here, and all of the sudden the clients see a huge savings when you put it all together. When working with a planner, no matter which one, we are filled with guidance, cost effective ideas and of course we offer peace of mind. How much is your peace of mind worth?? This past week, I had a chance to sit down with a developer here in Mansfield CT. He is developing an amazing wedding venue and wanted a planners input. It was fun to bring years of experience in venue shopping with clients to this meeting. The blue prints were impressive and it was a fun afternoon swapping ideas, and making suggestions. I of course had to force the issue that the woman's restrooms need to be bigger, a cocktail party space is needed and an extra bar area. I can't wait to see how this all progresses. In a sense of the familiar, I found myself today at the UConn Alumni Center. A venue I love, due to the fact it has been home to CT Bridal Event, 4 out of the 5 years, the space can handle numerous looks, and it does happen to be right down the street from me, just to name a few things. I did have the pleasure of working with a few new and old vendors, which I love. It gives us a chance work together in a fun setting. Of course the image master was Dave Field from Strawberry Road Creative. I am patiently awaiting to see what he captured (or at least I am pretending to be, and I haven't facebook harassed him yet) It is always a pleasure to work with talent, that for one has a great sense of of humor, passion for what he does and I hope knows better than to photograph me. It was fun to mix it up at a location that I've always enjoyed and with such a great crew. We even had time to swap a few marriage and raising children stories and laugh. I find it interesting when I get to see how others balance the business side with the personal side. How to top off your wedding cake??? Well, there is no rule on what needs to be on top. It is a great place to add a creative touch that is an example of both of you. Plus don't feel like you need to be shopping in a "wedding" store to find this perfect topper. The frogs are salt & pepper shakers that the bride just loved. While frogs were not the theme of the wedding, the bride did want to bring in a touch of herself into the cake topper. The cost of the salt and pepper shaker were a fraction of the cost of something similar from a wedding site. In love with your wedding flowers?? You can order extra flowers from your florist or consider sugar flowers. It is always important to compare the price and make sure if you go with edible flowers you are happy with the look. Erin from the Chocolate Rose Bakeshop, suggested that you discuss your ideas with your baker. It is important to factor in the weight of the topper. 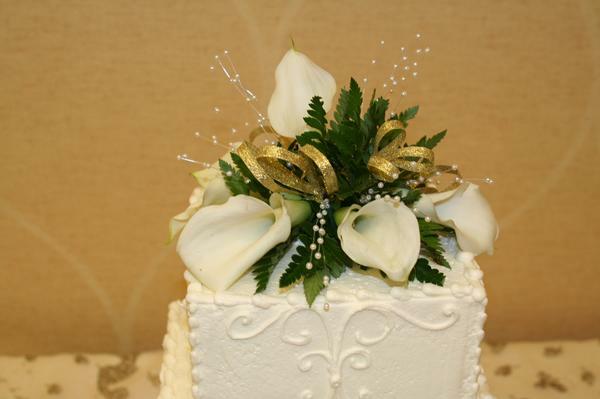 "The weight of the topper- it never fails to amaze me what some of these cake topper manufacturers will produce: some of these items weighing 3 pounds or more, forgetting that what it's going on top of is, in fact, a cake." Another point to consider is making sure the base is proportionate to the height. You can't have a 8 to 10 inch tall topper sitting on a 2 inch base. It will topple and fall and Erin has had to place the topper in front of the cake. If you do know what you plan on putting on top, make sure to show it to your baker. Not 100% sure what to put on top, why not a token from where you got engaged. 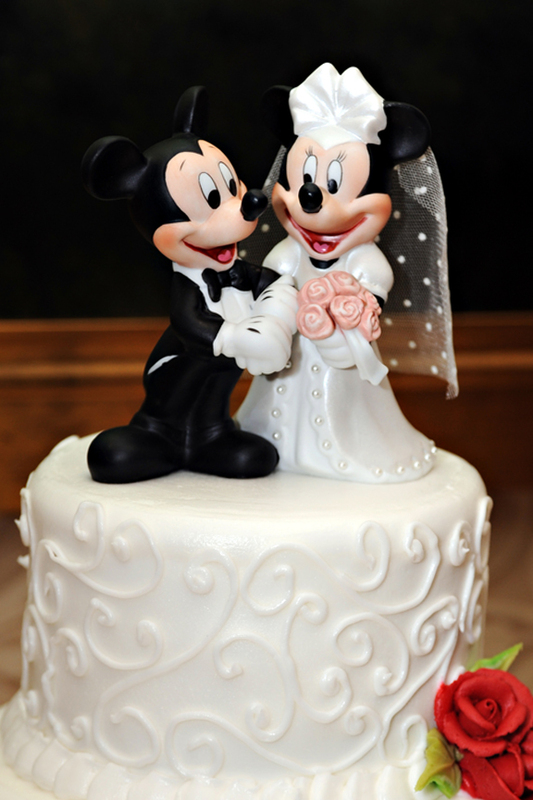 Check out the Mickey & Minnie, any guesses on where he popped the question?? 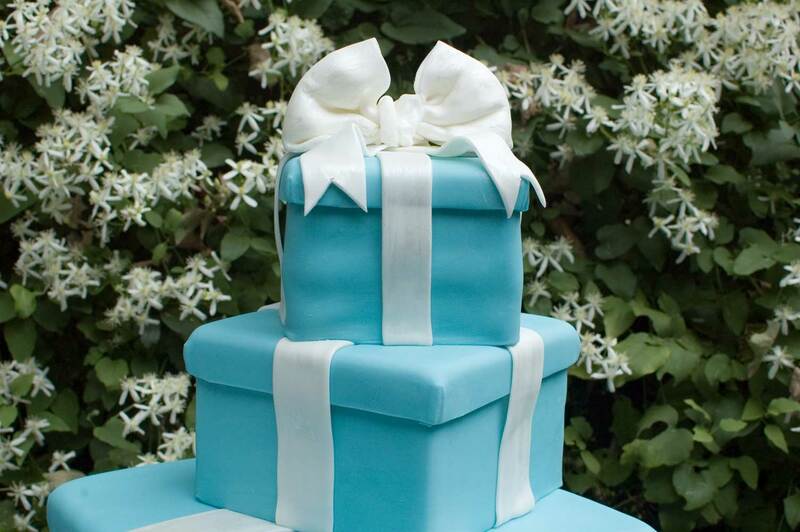 Or why not just have the topper be a part of the cake, like this creation by Uconfections. These boxes needed a bow and it was a perfect touch. The point is that no matter what you put on top, a monogram, a family heirloom or if you create your own topper, let it be an example of you as a couple.